A photojournalist who was found dead in Mexico City after he fled harassment in his home state appears to have been tortured before he was shot dead, the head of a free press advocacy group said on Sunday. 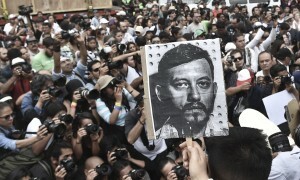 Ruben Espinosa sustained severe injuries to his face before he was killed, said Dario Ramirez, director of the Article 19 group. Espinosa was found dead late on Friday in an apartment in Mexico City. Three women who lived in the apartment and their housekeeper also were killed. They appeared to have been tortured and sexually assaulted before being shot, Ramirez said. All the victims were shot in the head with a 9mm weapon. But Ramirez was angered when Mexico City prosecutor Rodolfo Rios Garza said on Sunday he was pursuing all lines of investigation into the killings, including crimes against women and a possible robbery. Ramirez said Espinosa’s work and the threats that drove him out of his home state of Veracruz should be the main line of investigation. He had worked in the state for eight years, including for prominent newsmagazine Proceso, before fleeing to Mexico City. Rios never acknowledged that Espinosa was seeking refuge in Mexico City, saying he came to the capital for “professional opportunities”. When dealing with journalists’ killings, authorities in Mexico are often quick to discard their work as a motive, even though the country is the most dangerous in Latin America for reporters. In large swaths of the country, crime and corruption are never reported, as the media has been bought or intimidated into silence. Article 19 said it published an alert about Espinosa on 15 June after he reported unknown people following him in Veracruz, taking his photograph and harassing him outside his home in Xalapa, the state capital. Veracruz has been a dangerous state for reporters. According to the Committee to Protect Journalists, 11 journalists have been killed there since 2010, all during the administration of Governor Javier Duarte – the most recent just a month ago. Espinosa is the second Veracruz journalist to be found dead outside of the state. Espinosa’s killing has raised tension among reporters who long have considered Mexico’s capital to be a refuge from media intimidation and violence elsewhere in Mexico.